• ADD TO YOUR COLLECTION & support our work at "Fund-Raiser." We have arrived in Soroti where we will be for two weeks, 1st out in the village of Kamuda, 2nd in Soroti itself. While we were in Apac in north central Uganda teaching Church Planting, we heard of something interesting that required a brief side-trip. We had little time in our schedule for side-trips, but we decided this was interesting enough that we would check it out on Saturday morning before we moved on to our next teaching point. 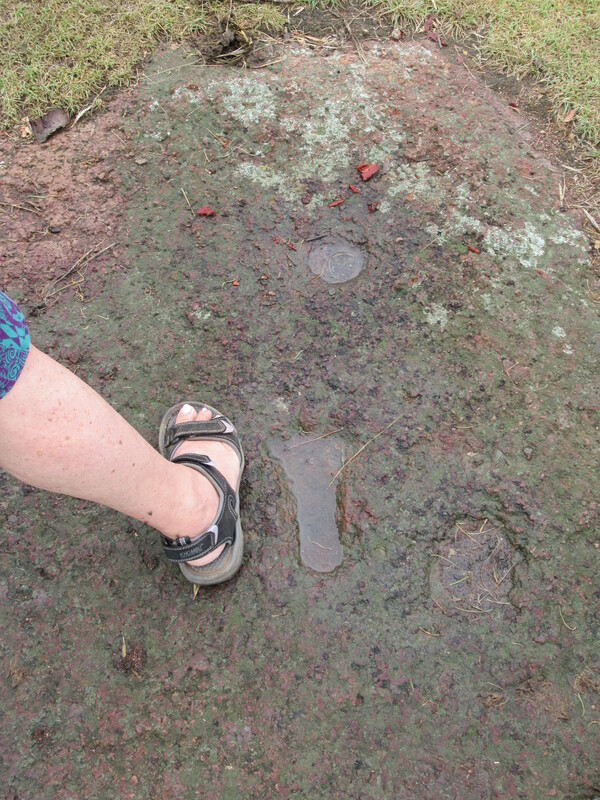 The people we were with told us that on the back side of the mountain, there were human footprints in stone, discovered in 1956 as a farmer was clearing brush. The “mountain” amounts to a huge rock up-thrust in the middle of the very flat plain that Apac sits on. It is so flat there, and most of the surrounding area, that any rise in the terrain is very noticeable, so this rock dominates the landscape for miles. 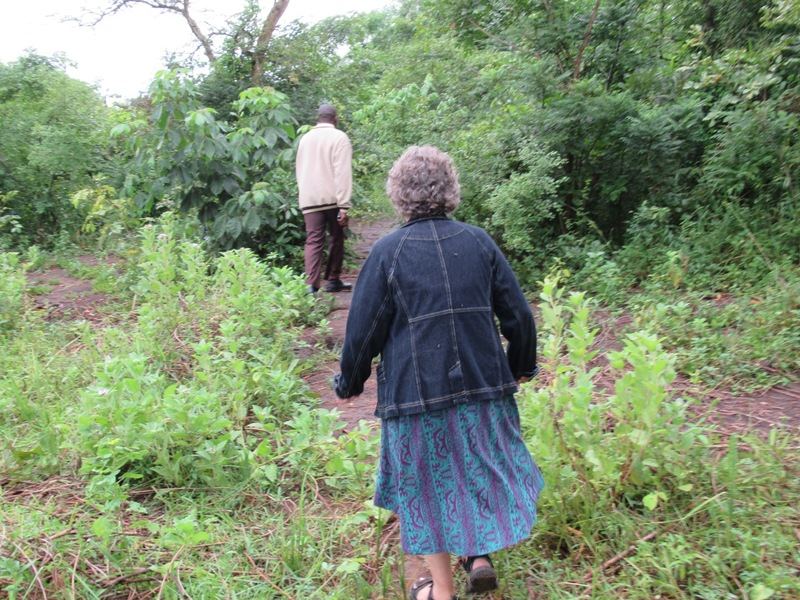 We wanted to see this phenomenon of the footprints because they said we could drive back to the area through the bush and then walk into the footprints a short distance. The muddy track we began our adventure on. 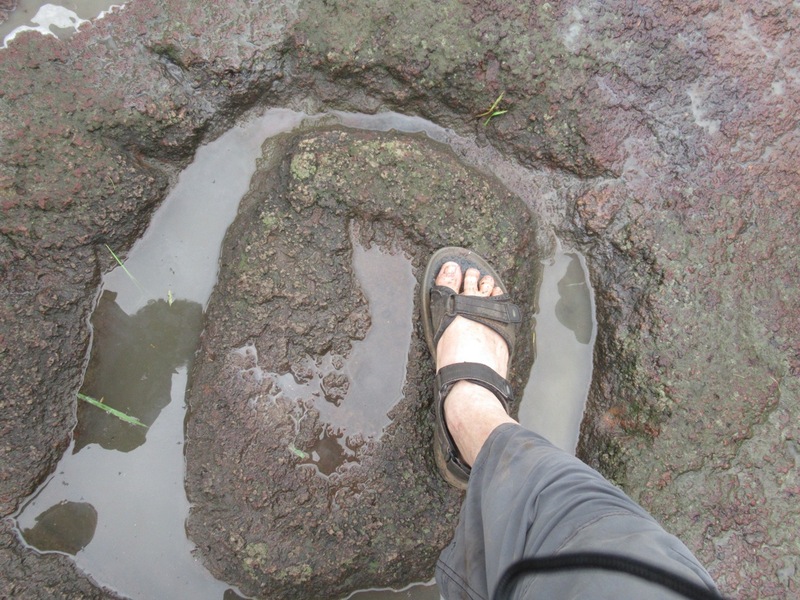 Of course, there is much local mythology about the footprints, which must be very old, though I am no paleontologist or geologist to be able to determine the age. The tales all point back to the origin of the local Lango tribe. According to the story, a certain king died and passed the tribal spear of leadership on to his son. One day while the new king was out hunting, an elephant began to uproot their crops back at the village, and all the villagers were terrified. The King’s brother woke up because of the noise, and when he saw the elephant, he ran into the place where they stored the weapons and grabbed the first spear that he could, ran out and threw it at the elephant. The spear stuck into the elephant’s side and it turned away and fled into the bush. 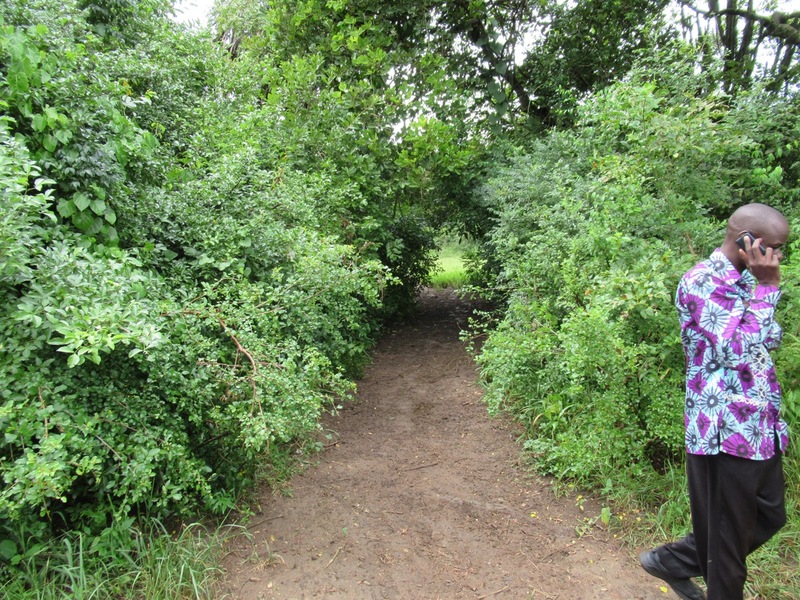 Ever deeper into the bush…but never out of cell phone range, apparently! The king returned from his hunt right in the middle of the village celebration where his brother was being heralded as a hero. Because it was his job to protect his village, he became angry and jealous that his brother was receiving such acclaim. Then he discovered that the spear his brother had used to drive off the elephant was his own ceremonial spear of office, and he flew into a rage. He ordered his brother to chase the elephant and recapture the spear, a task that was nearly impossible. The brother had no choice but to leave the village and pursue the wounded beast. He searched for a legendary amount of time, some say years, and was unable even to find it. Finally, sick and dying in the jungle, he was found by an old woman who lived alone and who nursed him back to health. He could not return to his village without the spear, so he stayed for a time with the woman. One day in his hunting journeys around that region, he stumbled upon an elephant graveyard, where elephants go to die. There among the skeletons and bones, he found the spear. The woman valued his presence and help to her while he had stayed with her, and before he left she rewarded him with a bag of beautiful beads that she had made. He returned home in triumph, virtually from the dead since no one thought they would ever see him again. Even the king was glad that his brother had returned, and received his spear back with joy and welcome. However, the brother was suppressing a root of bitterness over his lost years and near death in pursuit of the elephant. One day he sat stringing the beautiful beads into a necklace. One of the beads fell to the ground and rolled a little away, unnoticed by the brother. The two-year old daughter of the king was crawling nearby, and as children do, she found the bead, and swallowed it before the brother could retrieve it. Now the bitterness emerged as a plan. He went to the king, demanding that his bead be returned to him immediately – he needed it right now. The king was horrified as he realized what his brother was demanding, and he begged his brother to wait until the bead had passed on through. But, thinking only of the years of suffering in the jungle, the brother demanded even more stridently that the bead be returned now. The king had no choice, it seems, according to the story, but to sacrifice his daughter to retrieve the bead, and the brother now had both the bead and his vengeance (atruly horrible little story that presages Stephen King by centuries). 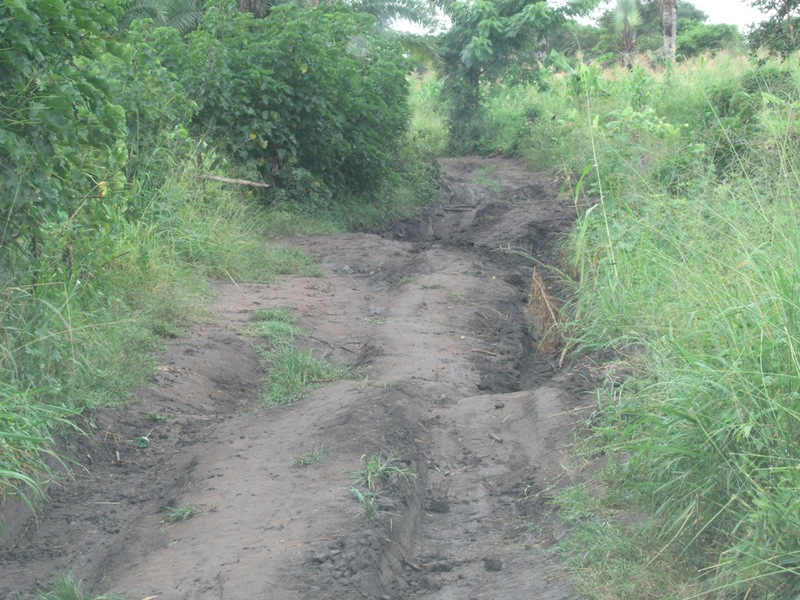 Someone tried to steal this clear footprint, filled with water from rainy season, but fortunately, were chased by the police before they could succeed in breaking it free. The situation never healed between the brothers, and strife continued to arise between them, so eventually the tribe agreed to separate, one part going to the north and the other moving south, marking the border between them with a hatchet buried in a tree. 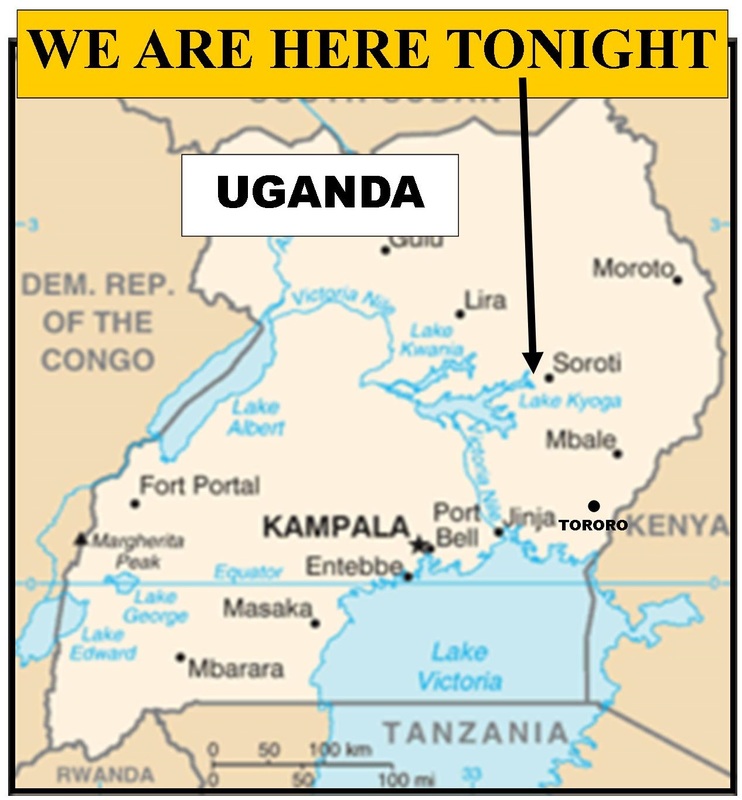 And this explains why to this day, according to my informants, the languages of the Acholi tribe to the north is almost identical to the local language of the Lango tribe in the south where we were standing when they told me this story. The footprints in stone have something to do with this history, though I was never able to suss out the exact relationship. Perhaps it is just that when they view these ancient markings, they are reminded of their cultural histories. There was even a third brother involved who was a giant, but again, even after my just short of pestering them with questions, the relationship of the giant to the footprints or the story never became clear, and I am left with no information at all about the giant. A pair of ancient handprints. Saturday morning our little expedition drove back into the bush some kilometers, then parked the car and walked down a very rugged track, then veered off onto a barely discernible trail through thick jungle-like brush which made me remember that no one in the world knew where Gail and I were at that moment. We continued for some little way and then broke out into a large opening with an excellent view of the back side of the “mountain.” There in front of us was a meadow whose surface was broken by what seemed to be flat sedimentary rock that was many meters across. Indeed, there were very obvious human footprints of ancient Africans embedded clearly in the stony surface, perhaps this tribe’s forbears, or perhaps a tribal group that preceded them. It seemed to be the petrified surface of an ancient mudflat. The footprints were of all sizes, men, women and children. 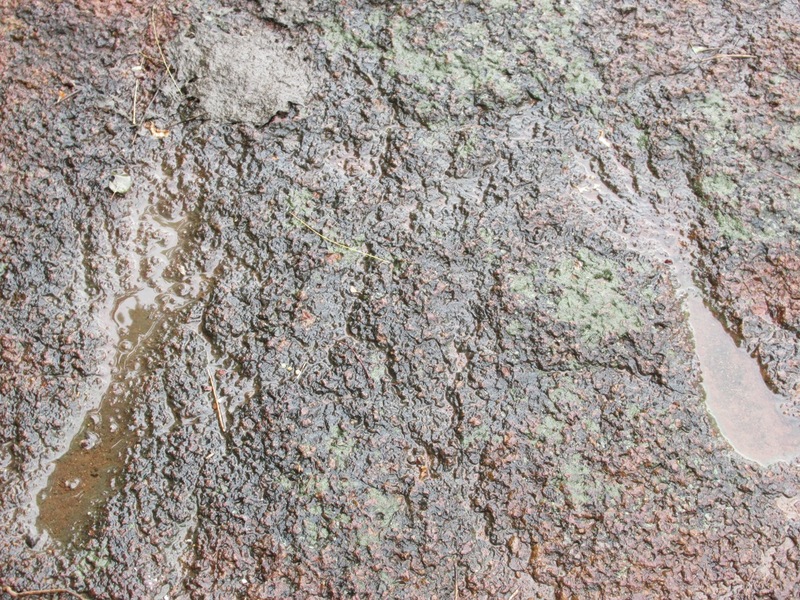 Many were just indents remaining after years of erosion, but some clearly showed the toes and heals of human feet. There were other manmade gougings which they explained in various ways, but it was apparent that a group had passed this way and had perhaps even spent some time in the area before moving on. A smaller footprint, also quite clear. The owner of the property came out from the trees and greeted us. He explained that the tracks are obvious in the rocks all the way back up to the mountain, 1 kilometer distant. He also told us that annually in December many people make the excursion out to visit the footprints, many staying overnight, camping, and even setting up a temporary market back in the forest a ways where they sell food and souvenirs to the visitors. He also said that the government is studying a way to preserve and protect the footprints as an historical site, but that nothing has actually yet been done. We could see his livestock grazing nearby, just as they have always done back into antiquity, and we felt that we, ourselves, were standing inside history. We had a wonderful adventure. It was well worth the time and effort, and we made a memory with our African friends that will last our lifetimes. The owner of the land (in yellow galoshes) cordially greets our expedition to the site.